Over the past three days, Event #37: $2,500 Eight-Game Mix has played out at the 2012 World Series of Poker and tested 477 players’ mettle in a variety of games: Triple-Draw 2-7, Limit Hold'em, Omaha 8, Razz, Stud, Stud 8, No-Limit Hold’em, and Pot Limit Omaha. While we were scheduled to have a winner by now, circumstances have brought about the need for a fourth day as David “ODB” Baker and Greg “FBT” Mueller have hit the hard-stop time on Day 2. That means they’ll return on Friday at 3 PM PST to play it out. Action will pick up in Level 30 with two hands remaining in Stud; furthermore, Mueller will enter with 2.655 million chips to Baker’s 925,000. Will Mueller be able to capture his third gold bracelet or will it be Baker’s time to win his first? You’ll have to wait a little longer to find out, but a winner shall be determined soon. We’ll also bring you a full recap of all the action from Days 3 & 4 at that time. Until then, good night and good luck. From the button Greg Mueller limped for 30,000 and David Baker checked. The flop came down and Baker check-called 50,000. The turn was the and Baker lead out for 100,000. Mueller called and the river was the . 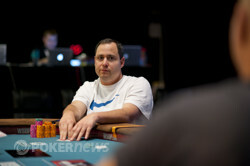 Baker stared to the table for a while before grabbing chips and betting 230,000. "Call," Mueller announced right away, and Baker showed the . Mueller had and won the pot. On the final hand of Stud Eight or Better we finally caught a hand that went to showdown. 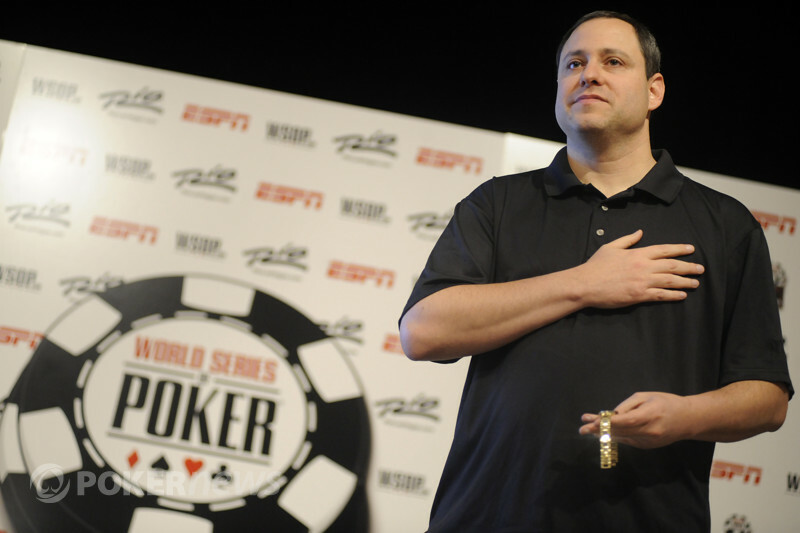 David Baker scooped up the pot and gained some momentum over Greg Mueller who won only one hand during this round of stud. Baker had the 20,000 bring in and Mueller raised it up to 60,000. Baker called. On fourth street Mueller fired out 60,000 and Baker called. Fifth street gave Baker a pair of deuces and he fired out 120,000, Mueller called. On sixth street Mueller called another 120,000 and Baker checked seventh right away. Mueller checked behind and mucked when Baker turned over for two pair. This was the last hand over Stud and we are now moving on to 2-7 Triple Draw. The last round, which was limit hold'em, has also come and gone without a big hand. With that said, the blinds do add up and Greg Mueller managed to swipe more than his opponent, which means Baker has been knocked down to 720,000. 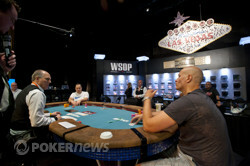 In the last round, which was pot limit Omaha, the players gave each other walks in six of the eight hands. Seems like they're more than willing to wait for the right spots. With that said, they only have about 40 minutes to make something happen before action is halted for the day. David Baker had the bring in and then called a completion from Greg Mueller. The latter then bet the turn before both men checked fifth. On sixth, Baker bet and Mueller called, action that was repeated on seventh. Baker's seven-perfect was good and he chipped up to over a million. One more level before play ends, can Greg Mueller close it out or does David Baker have a come back left in him? That will be the question for this level.